Value chain finance (VCF) represents the aligning and structuring of finance within a value chain or as a result of its existence. Given the growing need to explore innovative approaches to rural and agricultural finance in Nigeria, such financing solutions have become imperative. However, few studies on the ex-ante impact of financing innovations exist. Therefore, to ascertain the benefits derivable from VCF, this paper analyzes the potential impact of VCF on plantain production in Nigeria. The expected benefits are estimated based on the economic surplus model, using the Dynamic Research Evaluation for Management (DREAM) software. Results from a 25-year simulation period at a 15% discount rate and an innovation cost of USD 1,300,000, show that, in the least optimistic scenario, the economy is expected to have an overall net gain (economic surplus) of USD 3256,800, with a net present value of USD 3406,880, benefit–cost ratio of 3.83, and an internal rate of return or break-even discount rate of 36.80%. These results indicate the positive impact of VCF, measured in terms of net present value and net benefit, expressed as producer and consumer surplus. This suggests VCF is a viable and beneficial financing innovation for food production in Nigeria. Finally, it is recommended that a value chain financing agency be established to make finance available to farmers to boost food production in Nigeria. Smallholder farmers face several challenges in increasing productivity. However, access to requisite financing has been noted to be a critical challenge in many developing countries (Anang, Sipiläinen, Bäckman and Kola, 2015). Therefore, bridging the financing gap of these farmers must become a priority. Where this is absent, farmers often rely on informal instruments, which although are accessible and flexible they are also inefficient and costly in the short term and do not always offer the support needed to help transform subsistence farming into a profitable business (Okonjo-Iweala and Madan, 2016). Unfortunately, due to the challenges associated with delivering rural and agricultural finance, most commercial financial institutions are not interested in financing farmers and other rural clients because they represent a less familiar, riskier, and less profitable market than their more traditional urban clientele (World Council of Credit Union (WOCCU, 2009). There is thus the need to urgently explore innovative approaches to rural and agricultural finance (IFPRI, 2010). In this context, value chain financing (VCF) presents an innovative approach to rural and agricultural financing, as it enables the understanding of both financing within a value chain and financing tailored to fit a value chain (Miller and Jones, 2010). Specifically, agricultural VCF is the financing of agriculture and agribusiness within a chain, aligning and structuring finance with the chain or as a result of its existence (AfDB, 2013). Fundamentally, this framework hinges on market orientation, without which the resulting financial services would fail, and its approach requires that financial institutions consider the financial potential of the entire value chain, not only the creditworthiness of individuals. This focus shift allows financial institutions to more accurately measure and mitigate risk. However, this type of finance is not always available, and actors in agricultural and rural value chains frequently complain about the lack of access to financial services (WOCCU, 2009). In Nigeria, the various financing windows provided by the federal government through the Central Bank of Nigeria (CBN) are presently not fully utilized by farmers due to a lack of awareness. Further, many of the previously implemented financing initiatives were rather from an “intervention perspective” than a participatory perspective, often ignoring the need for farmers’ participation in drawing out financing initiatives. Therefore, while these financing measures have attempted to overcome existing barriers and expand access to formal finance in rural communities, their success has been rather elusive. As a result, many rural households in Nigeria still lack access to reliable and affordable finance for agriculture and other livelihood activities (IFPRI, 2010). In this context, the VCF approach ensures that actors within a value chain are actively involved in the process and creation of financial products that fit the chain, as well as agree with the financing institutions on the workable and acceptable modalities for such financing. The plantain (Musa Spp) is considered a “high value crop” with enormous potential, Nigeria being ranked among the 20 most important plantain-producing countries worldwide (Food and Agriculture Organization, 2011). However, the production concentrated in the southern part of the country is inconsistent and low, being mostly produced by small-scale farmers (Federal Office of Statistics, 1999; Akinyemi, Aiyelaagbe and Akyeampong, 2010). Therefore, an increased plantain production through VCF is desirable, as the crop has the ability to contribute to food security, employment, diversification of income sources in rural and urban areas, and gross national product Nkenda and Akyeampong (2003). While there exist ex-ante studies in agriculture using the economic surplus model, many of these studies however focused on innovations as it concerns inputs such as crop varieties, fertilizers and herbicides. Ex-ante studies on innovative agricultural financing initiatives are very rare. Also, many studies have analyzed ex-post the impact of financing initiatives, studies on the ex-ante impact of financing innovations (i.e., prior to their implementation) are scarce. This literature gap has partly contributed to the lack of success of some previous financing initiatives in Nigeria such as the Agricultural Credit Guarantee Scheme Fund (ACGSF) initiated since 1978; Small and Medium Enterprises Equity Investment Scheme (SMEEIS); Refinancing and Rediscounting Facility (RRF), established in 2002 and; The Large Scale Agricultural Credit Scheme (LASACS), established in 2009. The more recently initiated financing programmes includes the Anchor Borrowers Programme (ABP) initiated by the Central Bank of Nigeria in 2016 as well as the Nigeria Incentive-Based Risk-Sharing System for Agricultural Lending (NIRSAL). Many of these financing initiatives were implemented with little or no appreciable impact on agricultural production as no initial studies were carried out to determine their potential impact before implementation. This study however focuses on assessing the potential benefits derivable from VCF in meeting the financial needs of plantain producers towards increasing production. The economic surplus approach allows for the estimation of economic benefits generated by the adoption of technological innovations, compared to the situation before (without) adoption, when only traditional technology was available (Wander et al., 2004). Figure 1 shows the impact of technology innovation on economic surplus. If the supply curve moves to the right due to positive impacts of innovation on productivity and cost reduction, the consumer achieves gain of B + C (i.e., the consumer is benefiting from research because the price is decreasing). The producer loses area B due to price reduction but gains area A due to the increasing demand. The impact on the producer depends on the elasticity of demand and supply curves. Therefore, the benefit of innovation for the society will be the sum of areas A and C. However, as shown by Masters et al. (1996), sensitivity analysis ensured that the elasticities of supply and demand have little influence in determining economic surplus compared to other variables (e.g., price, productivity, quantity). Therefore, the economic surplus method requires information on productivity increases generated by innovation, equilibrium price of assessed product, adoption rate and costs, timeframe between innovation and adoption, and price elasticity of supply and demand. With this information available, it is possible to calculate the magnitude of the change in the supply curve as a result of the adoption of technological innovations (Maredia et al., 2000). The concept of economic surplus is the most widely used method to analyze the economic impact generated by agricultural research (Avila and Ayres, 1987). Avila (2001) noted that, under this approach, the coefficients on price elasticities of the demand and supply curves of the product under evaluation, shift of the supply curve, price changes, and production values of the product area are used. As the supply curve would be located on the left-hand side if no technological innovation is generated by agricultural research, he concluded that, when innovation occurs, consumers benefit from the increase in the supply of products and the producers from the reduction of production costs. Impact assessment aims to determine the consequences of an intervention on development. The analysis can either be ex-ante (i.e., conducted prior to the intervention) or ex-post (i.e., after the project is implemented). 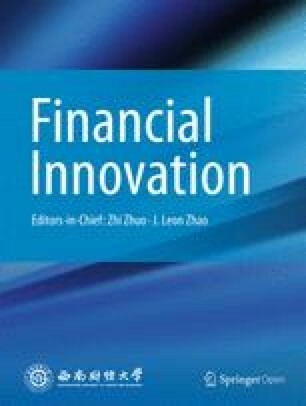 The former analysis can help with difficult decision making for the allocation of limited resources and is based on some type of prediction model, while the latter can determine the impact of past investments in innovation on target beneficiaries, as it is measured at some point in time after the intervention has taken place (Macharia et al., 2012). As resources for agricultural innovation and development have become increasingly scarce worldwide (Anderson et al., 1994), ex-ante impact assessments of the potential benefits and research costs or innovation investments are being used by more national and international research centers to aid in priority setting and resource allocation (Anderson, 1992). The economic surplus model has been thus used to measure the benefits of crop research in inducing supply changes (e.g., Norton et al., 1987). According to Harberger (1971) and Rudi (2008), three assumptions must hold for an economic surplus analysis: the competitive demand price for a given unit measures the value of that unit to the demander; the competitive supply price for a given unit measures the value of that unit to the supplier; and when evaluating the net benefits or costs of a given action (project, program, or policy), the costs and benefits accruing to each member of the relevant group (i.e. family, city, state, nation, world) should be added without regard to the individuals to whom they accrue. Several empirical studies apply economic surplus in evaluating the impacts of new agricultural technologies. These studies treat specific new technology evaluations in diverse market contexts. For instance, Norton et al. (1987) estimated the potential benefits of an agricultural research and extension program in Peru. Their study examined the effects of demand shifts over time and the influence of government pricing policies on research benefits. Pimental et al. (1992) estimated environmental and social costs of pesticides in the United States, concluding that applying pesticides costing USD 4 billion resulted in USD 16 billion savings for a given year, while environmental and social costs amounted to USD 8 billion. Mills (1998) evaluated the potential impact of public sector research on maize with and without trade barriers on foreign trade in Kenya. They used an ex-ante technique, emphasizing the importance of relaxing the trade barriers for the benefit of consumers. Hareau et al. (2006) used ex-ante evaluation of the economic impact of herbicide-resistant transgenic rice in Uruguay. They found that the benefit for a multinational company that would develop the technology was USD 0.55 million. Moyo et al. (2007) proposed a procedure for predicting the ex-ante impacts of agricultural research on aggregate poverty and applied it to estimate the poverty-reducing impact of peanut research in Uganda. Rusike et al. (2010) carried out an ex-ante evaluation of cassava development research in Malawi, their results showing a high proportion of farm households are not self-sufficient in food production and can be assisted by increasing land and labor productivity in production for the processing and marketing of cassava to reduce deficits and increase market surplus. Ayanwale et al. (2011) assessed the potential economic benefits derivable from the adoption of the Integrated Agricultural Research for Development (IAR4D) approach in the Sudan Savanna taskforce using the Kano-Katsina-Maradi Pilot Learning Site. Their results showed that IAR4D research and the extension concept yielded an estimated rate of return higher than the prevailing market interest rate and confirmed that adopting the approach generated several benefits in excess of research and extension expenditures. Macharia et al. (2012) assessed the potential economic and poverty impacts of 11 improved chickpea varieties released by the Ethiopian Institute of Agricultural Research. Using an economic surplus model, they estimated a total benefit of USD 111 million over 30 years. Consumers were estimated to obtain 39% of the benefit, and producers, 61%. The benefit–cost ratio (BCR) was estimated at 5:1 and the internal rate of return at 55%, indicating the investment is profitable. They believe that the generated benefit was expected to lift more than 0.7 million people (both producers and consumers) out of poverty, and concluded that further investments in chickpea and other legume research in Ethiopia is justified for poverty alleviation. These studies, among others, used the economic surplus model to measure the economic impact of research or innovation vis-a-vis their investment costs. However, their focus was more on production inputs, such as seeds, fertilizers, chemicals, and improved varieties. While these inputs are necessary and important for any agricultural production, innovations are not limited to agricultural production inputs. According to Ellinger and Barry (2015), in the current risky economic environment, credit should be managed as closely and as carefully as other production inputs as, similar to seeds and chemicals, agricultural credit is changing and expanding with new and innovative products. 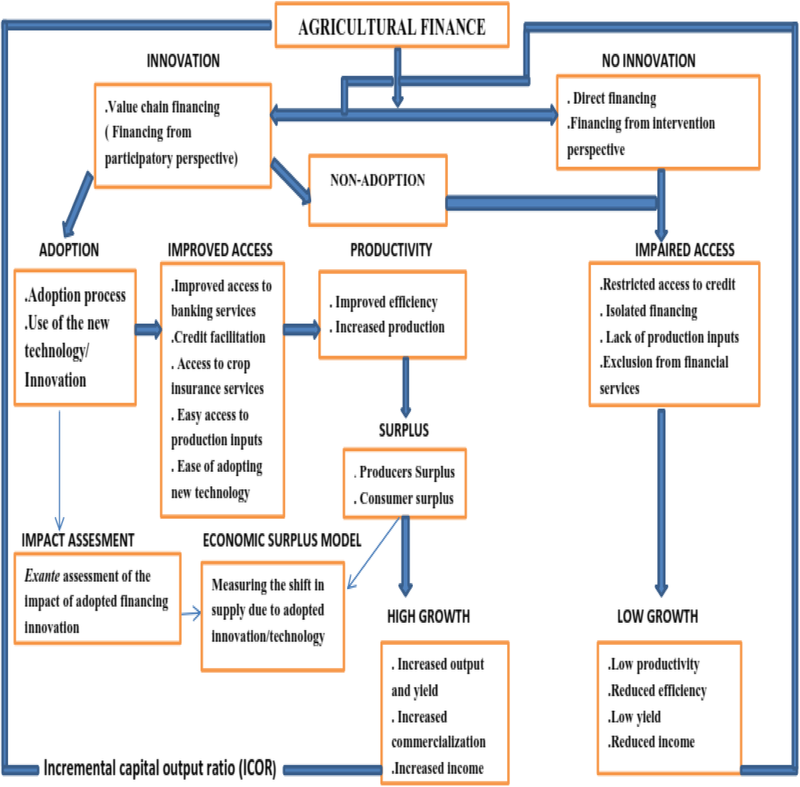 This study thus considers the scare and limited nature of financial resources in the form of credit, using the economic surplus model to measure the potential impact of VCF as a form of financial innovation for agricultural production to ascertain the benefits or detriments of such innovation prior to implementation. As such, this study makes a methodological contribution to the application of the economic surplus model. Primary data (e.g., quantity of plantain produced, price, yield) were collected through a multi-stage sampling procedure from 300 plantain farmers in three states of the southwest region of Nigeria. The region was selected because it is one of the major centers of plantain production in the country (Akinyemi et al., 2010). Secondary data were sourced from the National Bureau of statistics (NBS), CBN, journals, and other publications. The expected benefits of VCF on plantain production were analyzed using the economic surplus model through the Dynamic Research Evaluation for Management (DREAM) software developed for the International Food Policy Research Institute (IFPRI) by Wood, You, and Baitx (2001). 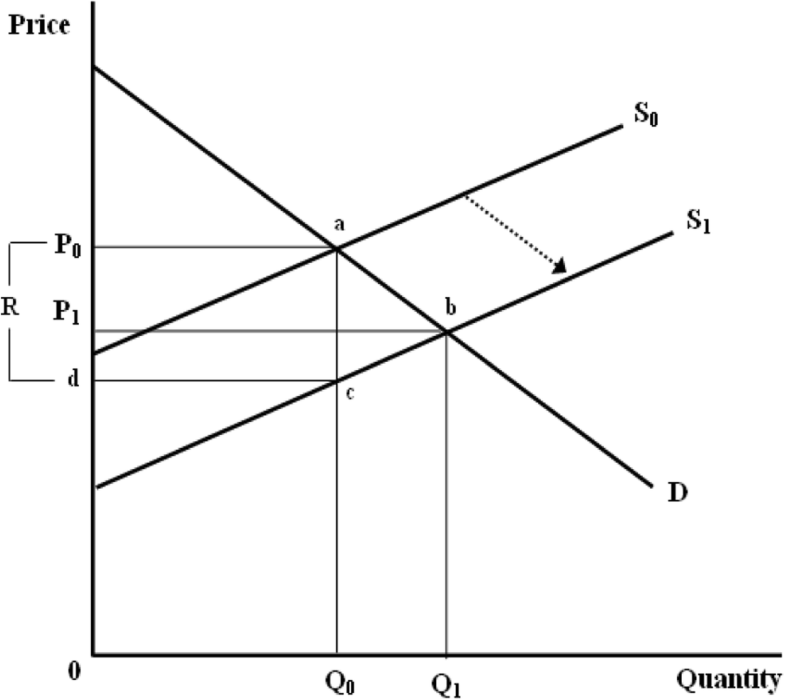 In each year, the downward shift from the initial market equillibrium price of the supply curve due to VCF-induced cost savings from the initial market equillibrium price before the supply shift is P0, while P1 represents the new equilibrium price due to increased plantain production; ɛs and η are the supply and demand elasticities, respectively; μ is the intercept of the demand curve; α and ß are the slopes of the demand and supply curves, respectively; and ps is the probability of success of the innovation. Additionally, the changes in producer, consumer, and total surplus in a closed economy are given by eqs. (3–6). The notations are described in Table 1. The summary of parameters used for the economic surplus analysis is shown in Table 2. The model also estimates the social gain indicators from investment in VCF innovation. By introducing into the model, the flows of investments in the deployment of VCF, indicators of social gains such as the net present value (NPV), internal rate of return (IRR), and the BCR were estimated. Knowing the benefits and costs of the innovation throughout a period of time, it is possible to carry out profitability analyses to show its economic viability. NPV in the year t is equal to a flow of benefits generated by an investment minus a flow of costs of this investment discounted by an appropriate rate. If NPV is positive, then investment in the VCF innovation is considered profitable (Wander et al., 2004). IRR is the rate that turns the NPV to zero or turns the present value of benefits equals the present value of costs. The IRR should be higher than the rates available on the market for alternative capital use to consider the investment in the VCF innovation as profitable. BCR represents the relationship between the present value of the benefits and that of the costs. The investment in VCF is considered profitable if the BCR is above 1. Phase I: Identification and evaluation of potential value chains. Under this design, the financing outfit (credit unions, large processors, Banks, NGOs, Government establishment, etc.) first ensures that market demand exists for the commodity and that producers have the ability to meet demand because, without adequate product demand, both the financial institution and producers are at risk of significant loss. Second, an analysis of the strengths, weaknesses, opportunities, and threats of the value chain is carried out. Points along the value chain where providing access to finance could bring the greatest value and would represent a good investment for the financier are then identified. In other words, while every actor in a chain is considered before financing the chain, finance is not necessarily made available to every actor, but to the weakest link or actor where such financing would produce the greatest value to the entire chain. Finally, a scorecard tool is used to evaluate and rank the value chain and create a map of potential financing options. Phase II: Facilitation and leveraging of market linkages. To help improve efficiency and reduce dependency on intermediaries, the financing outfit brings together all value chain participants to identify problems, review their needs based on the evaluation in phase I, and commit to finding solutions. This phase is thus characterized by obtaining production and financial data from the meetings held to design appropriate loan products, where the participants identify and contractually agree on quality standards, minimum purchase prices for produce, and non-financial activities that would improve value chain efficiency. These provide reliable market information to strengthen small producers’ business relationships and secure market access. The commitment participants make in this phase becomes an integral part of mitigating the financial risk of lending. Phase III: Designing of financial products and evaluation of capacity to pay. In this third phase, the financing outfit analyzes the potential cash flows based on the information gathered during the workshops organized during phase II. It then designs products that directly reflect the financing needs of borrowers and the specific characteristics of chain actors. The financing outfit conditions disbursement and repayment schedules on production cycles and sets competitive interest rates to cover costs and provide profit margins. It also establishes the policies and procedures needed to address the risks associated with value chain loans, especially those made directly to producers. It then determines the best combination of collateral and signed contracts to cover the loans. Phase III thus reduces the financial risk of granting loans with unrealistic terms and/or inadequate amounts. By premising loans on both participants’ real needs and their capacity to pay, the financing outfit is more likely to increase productivity and guarantee repayment. Phase IV: Granting, monitoring, and collection of loan. The financing outfit disburses loans in cash or in vouchers, which permits borrowers to obtain discounted inputs such as quality plantain suckers, fertilizers, pesticides, tools, labor, and equipment from other value chain participants. In this stage, producer associations and technical assistance providers help monitor production, which reduces financial outfits’ operational costs and allows them to reduce interest rates on loans. Once the buyers receive the products, they channel payments to producers or associations via the financial outfit. They, in turn, deduct the full loan payment of the principal plus interest from the sales amount and credit the balance to individuals’ or producer associations’ savings accounts. Financing can be made available to any value chain participant, such as input suppliers, producers, producer associations, processors, and buyers. However, this study considers the situation where the bulk of loans is intended for small producers and producer associations, who are often considered the most vulnerable, hence the focus on plantain producers. The relationship between finance and growth, provides the basis on which value chain financing is considered to lead to growth in plantain production. In the growth model of Harrod and Domar (Hussain, 2000), the rate of capital accumulation plays a crucial role in determining growth. The model posits that the investment requirements for achieving a given growth rate are proportional to the growth rate by a constant known as the incremental capital output ratio. According to Department for International Development (2004), access to credit by individuals enables them to borrow funds and strengthen productive assets by investing in micro-enterprises; in productivity-enhancing new technologies such as new and better tools, equipment, or inputs such as fertilizers; or in education and health, thus facilitating greater capital accumulation and growth. However, the sustainable provision of credit and rational use of other inputs in the right proportions and at the right time are believed to be crucial to increasing output and productivity. The process, procedure, and management of providing financing presents the grounds for innovation which, in turn, requires adoption by plantain producers. According to Ellis, Lemma, and Rud (2010), the potential contribution that access to financial services can make to growth and poverty reduction is now widely accepted in academic and policy circles. The adoption of innovative financing approaches such as VCF is expected to provide financing in the form of credit available to producers, and this situation is expected to lead to increased plantain production. Here, the impact of adopting VCF is estimated ex-ante through the economic surplus model (Fig. 2). As previously discussed, following Alston, Norton, and Pardey (1995), several studies have applied the economic surplus model to estimate research and innovation benefits (Okike, 2002; Bantilan, Anupama and Joshi, 2005; Akinola, Alene, Adeyemo, Sanogo and Olanrewaju, 2009; Ayanwale, Akinola and Adeyemo, 2011). Table 3 presents the simulated cost and benefit of VCF for plantain production over a 25-year period in a closed economy. In a closed economy, there are no exports; therefore, all produced plantain is consumed locally. The first three years, representing the innovation time lag, show that the total economic surplus of VCF innovation is negative over the period of implementing the innovation; thus, no economic surplus is recorded for the consumers or producers in this stage. However, in the fourth year, the producer surplus is USD 15,200 and consumer surplus USD 29,400, for a total economic surplus of USD 44,600, which increased to USD 260,400 in the fifth year. This represents the number of years that the adoption of the VCF innovation was expected to lag. This implies that investment in VCF would start yielding benefits only after the end of the third year. The benefits accruing from the adoption of VCF equal the amount that was invested in its implementation in the ninth year, with a total benefit of USD 1,309,200. At the end of the 25-year period, the total economic surplus of VCF innovation for plantain production was USD 2,173,900, with the producer benefit being USD 743,700 and the consumer benefit USD 1,430,200. The BCR of implementing the VCF innovation in the sixth column of the table shows that the total benefit derivable from VCF became higher than the cost of implementing VCF from the fourth year of implementation, for a total of 3256.8 at the end of the simulation period. To determine the robustness of the simulated returns, parameters such as discount rate, adoption rate, yield change, and probability of success were varied to verify the corresponding changes in the benefits accruing to producers and consumers, NPV, and BCR. Varying the discount rate resulted in a varying total economic surplus derived from VCF, as seen in Table 4. The table shows that the economic surplus at a discount rate of 8% was USD 1,002,100, yielding an increase of over 200% compared to the surplus in the base scenario. This indicates that the lower the discount rate, the higher the value of economic surplus is. At the discount rate of 20%, representing a pessimistic scenario, NPV was reduced by 48% from the base scenario; however, the BCR was 2.4, still higher than 1. The table also shows that for an optimistic discount rate of 8%, the NPV increased by 62% from the base scenario, with a BCR times the cost of VCF innovation. IRR remained unchanged in the base, pessimistic, and optimistic scenarios. These results show that NPV is highest for a discount rate of 8%. However, at a 10% rate, the NPV increased by 49% from the NPV in the base scenario with a BCR 6.5 times the cost of VCF investment. These results suggest that a discount of 10% or below is more desirable for maximum benefit, considering that the present economic situation in Nigeria makes a single-digit discount rate of 8% seemingly unrealistic. From Table 5, the estimated changes in benefits as the rate of adoption changes from the base scenario show that, at an optimistic adoption rate of 70%, the value of economic surplus is USD 6,196,000, while NPV increased by about 34% from the base scenario, with a BCR 5 times the invested cost. At a conservative adoption rate of 5%, the economic surplus is USD 436.50, indicating that economic surplus increases with the adoption rate. NPV is reduced by over 100% from the base scenario and became negative, at USD − 563.91, while BCR is below 1 (0.3) and IRR less than the market rate of 15%. Additionally, at an adoption rate of 10%, the NPV is reduced by over 100% and negative, at USD − 126.5, BCR is below 1 (0.75), and the IRR of 13.5% is slightly lower than the prevailing market rate. However, at an adoption rate of 15%, although the NPV is reduced by 91% from the NPV in the base scenario, BCR is slightly above 1 (1.14) and the IRR is also slightly higher, at 18.1%. These results suggest that an adoption rate below 15% is not desirable for VCF as a viable and profitable investment in Nigeria. Table 5 also shows that as the adoption rate increases towards the optimistic scenario, as do the NPV, BCR, and IRR. Table 6 shows that at an optimistic scenario holds a 90% probability of success, where the value of economic surplus is USD 5,683,400 and NPV increases by 27% compared to the base scenario. For a pessimistic success probability of 30%, the NPV decreases by about 81% compared to the base scenario and the economic surplus is USD 1,877,300, increasing as the probability of success increases. However, the BCR is above 1 (1.65) and the IRR higher than the prevailing market rate, at 22.8%. This suggests that, even at a success probability of 30%, VCF is profitable and viable. This study assessed the potential benefits derivable from VCF in meeting the financial needs of plantain producers towards increasing production in Nigeria. Findings from the study showed consistent evidence that VCF as a financing innovation is a viable and profitable option for financing plantain production in Nigeria. Investment in VCF started yielding benefits in the third year with benefits equaling the cost of investment in the ninth year and a total economic surplus of USD 2,173,900 at the end of the 25-year simulation period. The sensitivity analysis showed the results remained robust even at a high discount rate of 20% and a low success probability of 30%. From the results, there was a positive relationship between the effectiveness of VCF, measured in terms of NPV, and net benefit, expressed as producer and consumer surplus. It can therefore be concluded that there is strong evidence that the economic returns derivable from investing in VCF for plantain production outweigh the costs of investing in the innovation, and investing in its implementation will significantly boost plantain production in Nigeria. It is recommended that policy actions for establishing a value chain financing agency under a public–private partnership be taken by the government. Such an agency will focus on analyzing commodity value chains and implementing a VCF approach that will boost food production, as well as improve smallholder farmers’ income and livelihood. However, efforts should be made to ensure that the interest rate be preferably maintained as a single digit. The limitation of this study is in the use of a crop (plantain) grown mostly in the southern part of the country. This is however due to financial constraint. Future studies with a crop such as maize that is widely grown across all the regions of the country is desirable to further assess the benefits derivable from implementing VCF in Nigeria to boost food production. The authors wish to acknowledge Dr. Wole Fatunbi of the Forum for Agricultural Research in Africa (FARA) for facilitating the partial funding granted for the data collection used in this study. Your support contributed immensely to the success of this study. This study received partial funding from Forum for Agricultural Research in Africa in the area of data collection. Corresponding Author – contributed to this paper in writing the abstract, introduction, the conceptual framework of the study as well as discussing the materials and methods employed in this paper. Co-author – contributed to this paper by running the simulation analysis through the DREAM software as well as the writing of the result and discussion section of this paper. All authors read and approved the final manuscript.